Situated in Cottonwood Heights just outside Salt Lake City and set in a replica castle, Castle Creek Inn is a medieval-themed bed-and-breakfast that offers a comfortable, family-friendly retreat. The charming inn features individually decorated, air-conditioned guest rooms with en-suite bathrooms, and private balconies or terraces with appealing views and a complimentary breakfast is served in the spacious dining room every morning. Drinks and snacks are available for guests throughout the day, and the Inn is surrounded by beautifully manicured and maintained gardens in which guests can relax. Castle Creek Inn is ideally located for a weekend break away from Salt Lake City or for exploring the city and its attractions, such as Crestwood Park, the Wheeler Historic Farm, and the shops, restaurants, bars, and nightlife of downtown Salt Lake City. 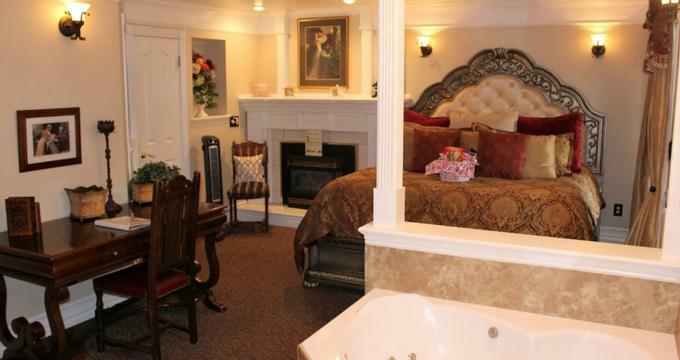 Castle Creek Inn features ten beautifully appointed and individually decorated guest rooms and suites with plush country-style décor and period furnishings. All accommodations have king or queen-size beds with pillow-top mattresses, high-quality linens and comforters and plush pillows, and en-suite bathrooms with walk-in showers, jetted bathtubs, fresh towels, bathrobes, and branded toiletries. Sitting areas have comfy sofas, chaise lounges, armchairs and working fireplaces, along with dining tables and chairs for in-room dining and entertaining. Modern amenities include mini-fridges, flat-screen televisions with cable channels, Roku TV, hairdryers, and complimentary wireless Internet. Private balconies, patios, and terraces have outdoor seating and lovely views of the gardens. The King’s Lodge features a king-size bed dressed in high-quality linens and comforters and plush pillows, and an en-suite bathroom with a walk-in shower, a jetted bathtub, fresh towels, and branded toiletries. The room has a dining table and chairs, a private pool table, a working fireplace, a flat-screen television with cable channels, Roku TV, and complimentary wireless Internet. Ivanhoe has a queen-size bed dressed in high-quality linens and comforters and plush pillows, and an en-suite bathroom with a walk-in shower, a jetted bathtub with a waterfall faucet, fresh towels, and branded toiletries. The room also has a full-size leather couch, a large dining table and chairs, and a private balcony with views of the back gardens. Romeo & Juliet offers a king-size bed dressed in high-quality linens and comforters and plush pillows, and an en-suite bathroom with a walk-in shower, a jetted bathtub, fresh towels, and branded toiletries. There is also a work desk and chair, working fireplace, ample closet space, and modern amenities such as a flat-screen television with cable channels, Roku TV, and complimentary wireless Internet. The Garden Suite is decorated with lovely floral décor with a fairy-tale window and vintage bird-cage. The room has a king-size bed dressed in high-quality linens and comforters and plush pillows, and an en-suite bathroom with a walk-in shower, a jetted bathtub, fresh towels, and branded toiletries. There is also a cuddle chair, working fireplace, ample closet space, and modern amenities such as a flat-screen television with cable channels, Roku TV, and complimentary wireless Internet. Rapunzel’s Tower, Cinderella’s Attic, Excalibur, Edinburgh, and Palace Royale have queen-size beds dressed in high-quality linens and comforters and plush pillows, and en-suite bathrooms with walk-in showers, jetted bathtubs, and shower/tub combinations, fresh towels, and branded toiletries. These rooms feature dining tables and chairs, comfortable armchairs, working fireplaces, and modern amenities such as a flat-screen television with cable channels, Roku TV, and complimentary wireless Internet. Canterbury has a king-size bed dressed in high-quality linens and comforters and plush pillows, and an en-suite bathroom with a shower/bath combination, fresh towels, and branded toiletries. There is chess /checkers table, a working fireplace, ample closet space, and modern amenities such as a flat-screen television with cable channels, Roku TV, and complimentary wireless Internet. A complimentary breakfast is served every morning and includes freshly baked bread and pastries, seasonal fruit, cereals and yogurt, a variety of signature dishes, and freshly brewed coffee, tea, and juices. The hotel offers a limited menu of dinner and dessert options for in-room dining, along with a variety of drinks and snacks available in the Grand Dining Hall throughout the day. Castle Creek Inn offers an array of facilities and guest services, including a complimentary hot breakfast every morning, drinks and snacks throughout the day, beautiful gardens with a patio and a hot tub in which guests can relax, and a fully stocked library with films and Roku TV. Castle Creek Inn has a magnificent dining hall, which can be hired for special celebrations and receptions, along with a range of services such as catering, entertainment, and décor.